The picture above shows the entrance to what remains of RAF Evanton. It shows two of the old hangars which survived recent gales, whilst two other, possibly older, ones on the opposite side have gone. The road, going right and left, is the arterial A9 from Inverness to Thurso; at one time known as the Great North Road. Another old, and historically important hangar can be seen in 'Picture Gallery' on the Navigation bar. The record shows that the airfield was established in 1922 to service the British Grand Fleet, then based at Invergordon. It was known, at the time, as Novar Airfield, named after the landowners Novar Estates. It is quite likely that the RAF started the airfield with the purpose of setting up a section with the name 'The Fleet Air Arm of the RAF' in 1924. That makes the history of Evanton airfield even more important. 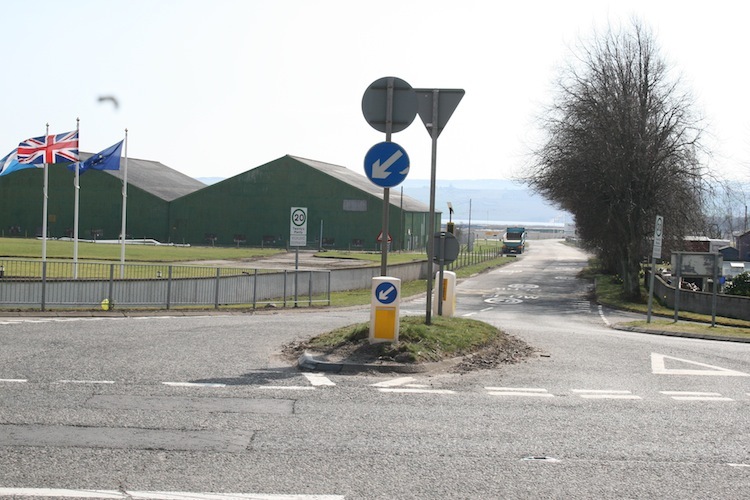 Another important function of Evanton Airfield was that Royal Navy aircraft carriers had to disperse their aircraft whilst at anchor at Invergordon. Eventually, it became a displaced persons camp about then and in 1955 became a short-lived US Airforce base for launching camera-carrying 'weather balloons' in the 'cold-war'period. There may be some important modern historical relics on Evanton Airfield such as an early example of a side-opening Fleet Air Arm hangar. There was another RAF station called RAF BlackIsle, not far away. "Secret Scotland describe it as a Satellite Landing Ground (SLG) and give the place o distinct air of secrecy. To quote them 'SLGs were designed to be secret places where replacement aircraft could be stored and kept safe from enemy attack', see their site for more info. A lot of useful work has been done by ARCH (Archaeology for Communities in the Highlands). Their website is at 'archhighland.org.uk' (Note the 2 h's).